Learning multiple unpivot option was little interesting for me. Here is the trigger which protects all the tables and procedures in a database / server. It’s important to make sure that your datatypes match across all layers in your application. For example, if a column’s datatype is NVARCHAR (50), you should have the code in queries and stored procedures use local variables of the same datatype. 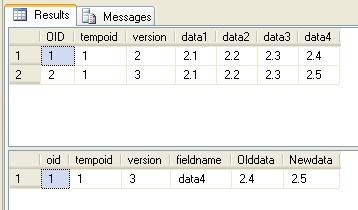 If the table is large, however, your update statement will lock the entire table and make it unavailable, even for data reads. Further more, a highly volatile table can bring down the entire application or website for the duration of the update. At times, a large, single transaction like this will greatly expand the size of the transaction log and — in extreme scenarios — contribute to running out of disk space on the database server. It’s considered a good practice for developers to implement numeric versioning of databases, just like they do with applications. It doesn’t require a lot of effort to implement versioning – you just have to create a table with a version number and additional timestamps. Once you get better at assigning a build number to each set of scripts and updating the version table when you deploy those scripts, it becomes much easier to troubleshoot and compare your databases. You could even code your scripts so that they don’t execute if the build number in the database is not higher than the build number in the script. The AWBuildVersion table in the AdventureWorks sample database is a good example to look at. This tip applies mainly to Web applications that pull data from a database. Less experienced developers often don’t realize that each database call is a relatively expensive operation. It’s not a big deal in small applications, but since many websites could become popular and used by thousands of simultaneous users, you need to start thinking about scalability and optimizing your page load times in advance. 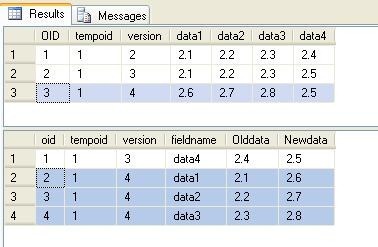 SQL Server is having a command line tool (TableDiff) to compare the data in two tables.It will perform the following task. "C:\Program Files\Microsoft SQL Server\90\COM\TableDiff.exe" -sourceserver "SERVERNAME" -sourcedatabase "DBNAME" -sourceschema "dbo" -sourcetable "SOURCETABLE1" -sourceuser "sa" -sourcepassword "PASSWORD" -destinationserver "SERVERNAME" -destinationdatabase "DBNAME" -destinationschema "dbo" -destinationtable "SOURCETABLE2" -destinationuser "sa" -destinationpassword "PASSWORD" -dt -o "C:\Documents and Settings\renjuraj\My Documents\diff.xls"
Run the above command in command prompt.Please refer your sql server installation path(C:\Program Files\Microsoft SQL Server\90\COM\TableDiff.exe).